Newcastle Choral Society, for the second year running, have helped Newcastle Samaritans to raise over £330, by singing carols in Eldon Square Shopping centre. 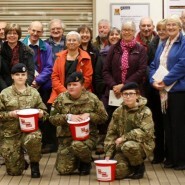 We also sang in aid of the Army Benevolent Fund in the rather chilly Monument Metro station to the tune of £118. Ho Ho Ho!